The open house is something of a coming-of-age celebration for CCE. In July, the Volunteer and Service-Learning Center within the Career Development Center became the Civic and Community Engagement Office, the first step in implementing Buffalo State’s Civic Action Plan. The office reports to Provost Melanie Perreault, who will join President Katherine Conway-Turner in offering brief remarks at 12:20 p.m. on November 29. Visitors will be invited to make journals for Compass House, an emergency youth shelter. Students in Phi Alpha Honor Society, Kappa Omega Chapter in the Social Work Department will donate the journals with other items they are collecting for Compass House. Rao joined Buffalo State in 2003 through a Learn and Serve America Grant designed to develop a service-learning program. 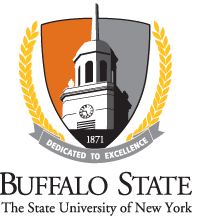 Today, CCE also seeks to inspire lives “of active citizenship and social responsibility,” contributing to the distinctiveness of a Buffalo State education. Experiential learning and the desire to make a difference both characterize Rao. “When I had my first hands-on learning experience as a college student, it gave me a passion for learning that I’d never felt before,” she said. She continued hands-on learning while earning her master’s in environmental education at the Audubon Expedition Institute at Lesley University in Cambridge. Aurora Schunk, assistant director of CCE, heads the alternative break program. “Students identify an issue they’re interested in, and they try to match that interest with community organizations that address that issue,” Rao explained. “Before the trip—it’s always a trip so the students have a total immersion—the students study the issue, and while they’re on site, they gather every evening to reflect and learn.” Interested students can also become leaders in the program. This fall, 74 courses incorporated community-based learning; 38 of them meet the College Senate’s criteria for service-learning courses. “This is a remarkable 26 percent increase in courses that engage students in meeting community-identified needs since last year,” said Rao. Fifty-two faculty members are participating, engaging 1,447 students in community collaborations.